Pork prices can rise and the economy can fluctuate, but consumption of bacon remains steady. Its sublime savory taste has been explained by scientists as well: Bacon boasts umami, the seductive “fifth taste” that rises above sweet, sour, bitter, and salty. 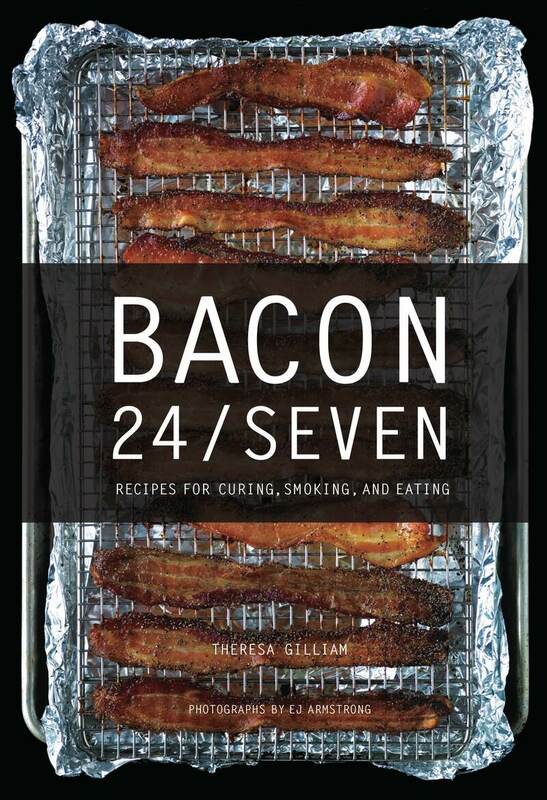 In Bacon 24/7 , author Theresa Gilliam and photographer EJ Armstrong have teamed up to feed the need for bacon. They include recipes for every hour, from dawn to dark, as well as info on topics such as how to cure and smoke your own bacon. Drool-worthy photographs highlight dishes such as Pasta Carbonara, Pork Belly Hash with Kale and Sweet Potatoes, and Bacon Crumb Apple Pie. Any evening that begins with a Bacon-Infused Manhattan holds the promise of becoming an unforgettable good time. Theresa Gilliam was a chef before entering the film industry, where she worked on major television and motion picture sets as a lighting technician. Her love of food would not be denied, however, so she found a career as a recipe-developer and commercial food stylist. E Jane Armstrong is the founding director of Armstrong Pitts Studios and Black Building Productions. Her award-winning photography has appeared in cookbooks and food publications nationwide. She has built an international roster of well-known clients, including Starbucks, Tyson, Continental Mills, and Whole Foods.